Glass candle holders supplier here now.OEM and ODM One-stop service Customized, Happy to send a sample to you for confirming quality. 1. Factory direct price, more competitive. 2. Mature technique, high quality, less defect product during production. 3. OEM & ODM are accepted. 4. Do any logo for customer on the glass for promotion. 5. Safe for food: Non-toxic, odorless materials. 7. On-time delivery and excellent after-sales service. 8. We have our own design team, any of your creative ideas will come true with our help. 2. Follow your design Mould Customized or our hot design recommend to you. We best service 7*24 hour online, happy meet in our factory. Mass goods time:25-40days, biggest order depends on quantity. 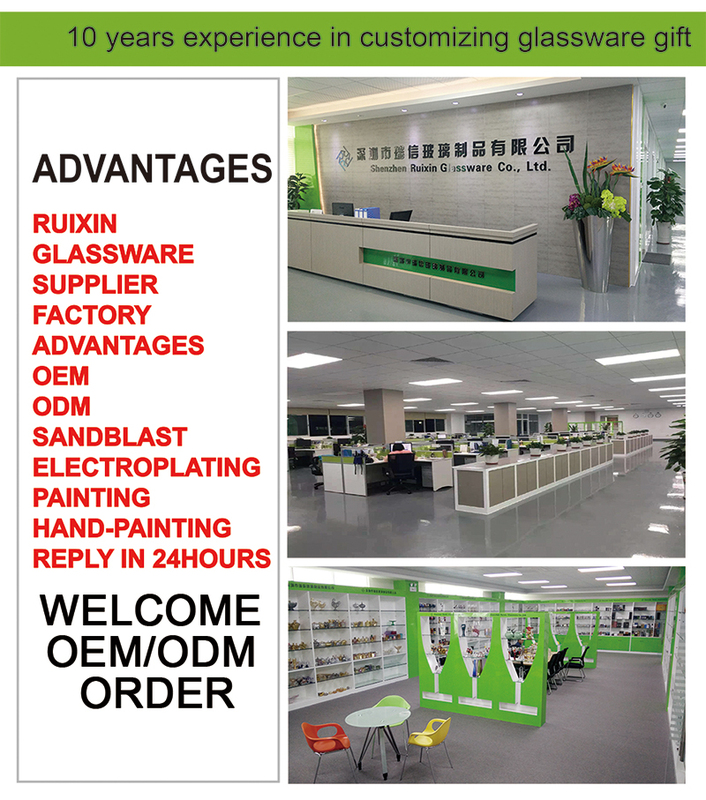 Shenzhen RuixinGlassware Company is one of China Glassware Suppliers, China Candlesticks Suppliers, Candle Holder Exporters. 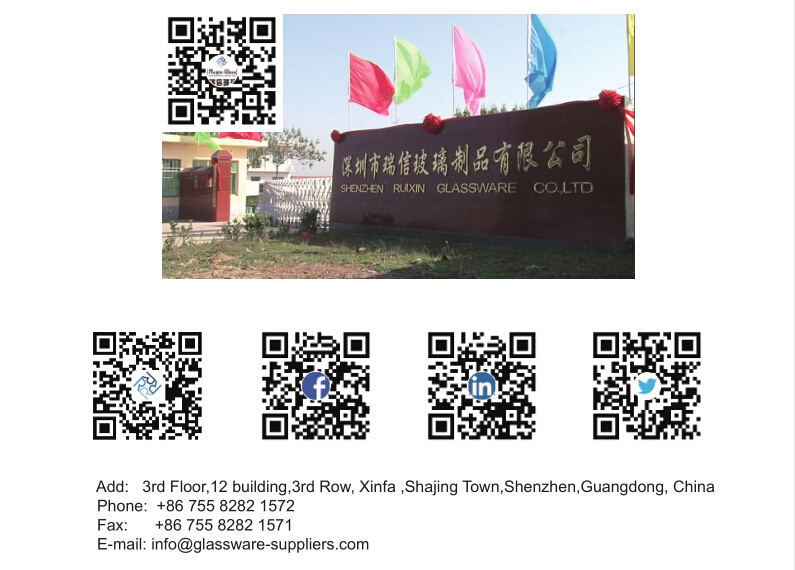 Glass Tumbler Supplier,Wine Glass Manufacturer and Glass Cup Factory. Where we can do Color Spray, Etching, Decal, Silk Screen, ect. 3. We have a big showroom in a factory. 4. We are TESCO etc supplier. 2.general packing and customized packaging follow your request: We have general packing, white/brown, color box and gift box, whole set gift box different ways packing it. Eg: each one has a sticker put on Bubble paper/Styrofoam+Wrapped in white paper avoid scratch, also each one uses egg cell separation, inner box, and carton. 1 Inquiry-Professional quotation, or send inquiry item more details design, we start contact more details. 3 our sales send the Proforma Invoice with our seal, or you order online by Alibaba trade assurance. 4 The customer makes the payment for deposit and sends us Bank receipt. 5 Initial Production Stage-Inform the clients that we have got the payment, And will make the samples according to your request, send you photos or Samples to get your approval. After approval, we inform that we will arrange the production & inform the estimated time. 6 Middle Production-send photos to show the production line which you can see your products. Confirm the estimated delivery time again. 7 End Production-Mass production products photos and samples will send to you for approval. You can also arrange the third party Inspection. 8 Clients make payment for balance and Ship goods, Inform the tracking number and check the status of clients. 9 An order can be said “finish” when you receive the goods and satisfy with them. 10 Feedback to our about Quality, Service, Market Feedback & Suggestion. And we can do better. 1. Some samples for free. 2. Free samples but need to pay a shipping fee. 3. Lowest shipping fee for you choose. 1. Sample fee will be refunded to you if quantity reaches our requirement. 2. Order Advance free sample for our VIP clients. 1. Available samples within 1 day send out. 2. Samples mix color and design. 3. Every day new item samples for you. info(@)glassware-suppliers.com 1. TOP 1 glass candle holder supplier and candle holder factory. Which are very welcomed by our new and old clients. Because head office are very close by the factory, so we can make the samples very fast. At the same time, our sales can keep an eye on the quality and delivery date at factory any time, so can communicate and give some feedback to our customers very fast and in time. This help us to make sure 100% delivery on time, and over 98% quality report are good. Such as Chinese, custom a candle product has many processes for your choice, color, logo, etching, or painting can be customized. China traffic is very convenient now, Ruixin Glass company as a veteran of the glassware manufacturing enterprises, since its establishment in 10 years has helped clients customized thousands of candle holder products if you want to consult the online customer service, customize their products of the votive candle holders, please contact us now. Q: Are you factory or trading Ruixin Company? Q: Can you provide certificates for glass candle holder? Send your inquiry to our good quality CD008 New Promotion 100% Full Test Free Sample Candle Holder Glass Supplier In China products.